Anna, Duchess of Bedford, was the wife of the seventh Duke of Bedford, and is widely credited with the very civilised custom of taking afternoon tea. During Anna’s time (1788-1861) it was customary for people to partake of a very large breakfast, followed by a light lunch, and then a large dinner again which was usually very late. The Duchess complained of a ‘sinking feeling’ in the middle of the afternoon and she ordered pots of tea and plates of cakes in order to fortify herself; her friends picked up on this delightful idea and they all took turns to throw tea parties of their own. What can I say? Thank you, Anna! My girlfriends and I are extremely civilised; I remember throwing tea parties for my dolls and stuffed toys when I was a little girl; I’d serve them delightful cups of tea and slices of cake (all imaginary, of course). Then I had real friends and I’d throw them tea parties, and well, it’s never stopped. I can’t really tell you how many tea parties I’ve hosted, and how many I’ve been to; I just know that I adore them. So, when I recently saw this post on Jennifer’s blog Delicieux, I couldn’t resist taking part. I wanted to showcase a very proper high tea and I used it as an excuse to invite some of my girlfriends over. 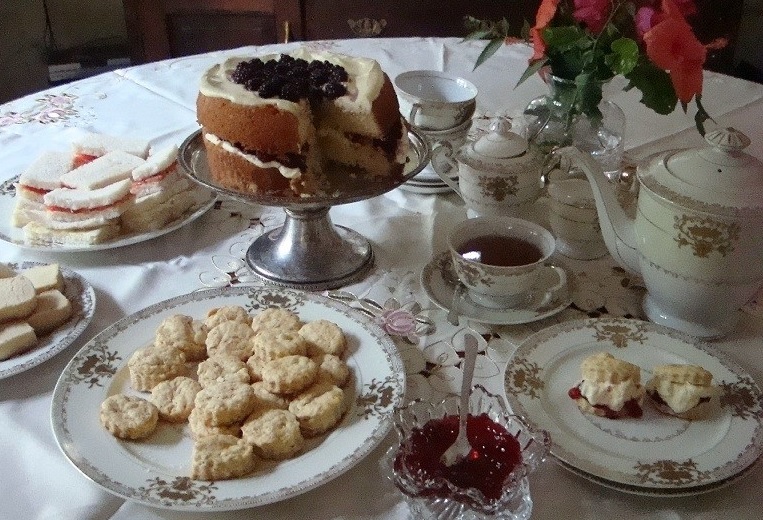 I plotted and planned with great gusto; I would serve a beautiful Blackberry Cream Cake, little baby scones with clotted cream and my very own homemade berry jam, deliciously thin cucumber and tomato finger sandwiches, and of course, butter biscuits. What’s not to love about that menu, right? It was to be a garden party; we’ve certainly been having the weather for it. But the monsoon FINALLY set in (much to my delight) so I was very happy to change it to an indoor party instead. I got out my prettiest embroidered tablecloth, the good china, and the silver flatware. A tea party is a reason to celebrate the good things in life; cakes that are as light as air and sandwiched with delicious sweet cream and beautiful preserved blackberries; biscuits that are so buttery that they melt in your mouth; baby scones hot from the oven and eaten sliced with clotted cream and homemade berry jam; finger sandwiches with thinly sliced pickled cucumber or tomatoes, and lightly seasoned; a pot of hot highly aromatic Darjeeling tea. The four of us, in our cotton dresses; laughing. One, my best friend since we were both three, and a mother to five. Another, a single mother to two little girls. The third, newly engaged and excited about the future. And me; single and soon moving to start a new chapter in my life. We talked; we laughed; we confided; we consoled; we ate. We were women, together. So different, and so alike. Don’t wait; host a tea party for your friends today. Celebrate your friendships. Celebrate your lives. Celebrate the fact that you can celebrate. Get out your good china; lay your table for your friends. Make them a high tea they will always remember. It will be worth it. I promise. 2) Cream butter and sugar together until light and fluffy. Beat in the eggs one at a time. 3) Add the flour a little at a time and combine. 4) Spoon the cake mixture into prepared (greased and lined) 2 x 20 cm sandwich tins and bake for 25 to 30 minutes or until golden brown and a skewer inserted into the centre of the cakes comes out clean. 5) Cool the cakes in the tin and turn them out onto a wire rack; peel off the lining and leave to cool completely. 6) When the cakes are cool, you can start to assemble them. Whip the cream until it forms fluffy peaks; take care not to whip it excessively or the cream will separate. Place one cake on a cake stand and spread half the whipped cream mixture onto the cake. 7) Arrange half the blackberries around the edge of the cake on the cream (as I have) and another ring of berries in the centre of the cake. 8) Place the second cake carefully on top of the first. 9) Slather the top of the cake with the rest of the cream mixture and arrange the remaining berries on it. 1) Preheat the oven to 200 C. Combine the flour, baking powder, salt, butter, and sugar until the mixture resembles fine bread crumbs. 2) In a separate bowl, beat together the egg, vanilla, and cream; add this to the flour mixture and bring together with your hands to form a soft dough. 3) Turn the dough out onto a floured surface and knead very briefly, for 10 seconds or so, to make it a little smoother. Now, using a little more flour, pat or gently roll out to a thickness of about 1 1/2 inches. 4) Using a 2 1/2-inch biscuit cutter (or a larger one, if you like, but they won’t be baby scones then), cut out about 8 disks of dough – pressing the cutter straight down, rather than twisting it, as this gives the scones a better chance of rising straight up. 5) Lay the disks on a lightly greased baking sheet, brush the tops with milk, and bake for about 15 minutes, or a little longer if the scones are large. To check that they are cooked, insert a wooden toothpick into the middle; it should come out clean. 6) Transfer to a wire rack to cool for a few minutes; serve warm. 1) In a large bowl crush berries with masher. Stir in sugar. Let stand 10 minutes stirring occasionally. 2) In small saucepan combine pectin and water. Bring to boiling; boil 1 minute, stirring constantly. Remove from heat. Pour into berry mixture. Add lemon juice and stir 3 minutes or until sugar is dissolved and mixture is smooth. Stir in lemon slices. 3) Ladle jam into clean half-pint jars (or freezer containers, if freezing) leaving 1/2-inch at the top. Seal and label. Let stand at room temperature 24 hours or until set. Refrigerate up to 3 weeks or freeze up to 1 year. Makes about 5 half pints. 1) Cream the butter and sugar together until pale and creamy. Add the flour and stir and then work the mixture with your hands to make a soft, smooth dough. 2) Turn the dough out and roll with your hands into a log about 12 cm long and 4 cm in diameter. Sprinkle a layer of demerara sugar on a piece of parchment paper and roll the dough in the sugar to coat. Chill the log in clingfilm for about 30 minutes until firm. 3) Preheat the oven to 160 C and grease a baking tray. 4) Remove the dough from the fridge and trim off the ends. Cut into slices 8 mm thick and place slightly apart on the tray. Bake for about 15 minuts or until brown. Cool on the baking tray for a few minutes and transfer to a wire rack. 5) When they are completely cool, store the biscuits in an airtight container until needed. I haven’t included a recipe for the sandwiches because I decided to just go with cucumber and tomato sandwiches. You can have your favourite sandwiches at your tea party; I would suggest two varieties. I would also recommend that you stay away from heavier sandwiches such as egg salad sandwiches; anything that reminds you of lunch and that is messy to eat with your fingers should be ignored for a tea party. I learned a long time ago to make the perfect cucumber sandwich and I’ll share those tips with you. Remove the skin of a cucumber and slice it very thinly; remove the seeds and discard. Soak the cucumber slices in a mixture of cider vinegar and water; the slices must be completely submerged in the vinegar and water solution. Leave for half an hour. Butter your bread with plain or herb butter (mint is best); drain the vinegar solution from the cucumber slices and turn out gently onto a kitchen towel. Blot the slices dry (as dry as you can without being OCD about it; *ahem*). Lay the slices of cucumber on your buttered bread and sprinkle very little salt and pepper on; cover with more buttered bread and trim the slices off (you have to be posh – it’s a tea party!). Ta da! My PERFECT cucumber sandwich! Have I inspired you to host your friends to high tea yet? Oh, please say I have! A proper tea rates high on my list of things I adore and that feel decadent to me. With my sister’s birthday in mid-December and mine right after Christmas, we have a hard time finding non-Christmas swamped schedule space to celebrate so we have instituted our own special dual birthday tradition. Mid to late January is quite depressing around here with the winter gloom and rain starting to weigh heavily, so we wait until then to go have High Tea together as our special sister time! I do so adore it. Oh, that sounds fabulous! What a lovely tradition to have; a great way to spoil yourselves! What a fun & delectable tea spread!! Love your blog!! That Blackberry Cake looks scrumptious!! !